Something to fight for? 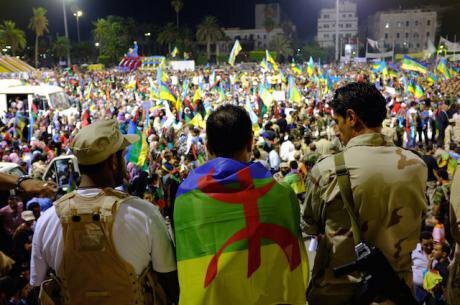 Atmosphere during Amazigh festival at the Green Square or Martyrs Square in Tripoli, Libya on September 27, 2011 – the first time the Libyan Amazigh could celebrate their identity and culture this way. Abd Rabbo Ammar / Press Association. All rights reserved.Libya is the launchpad for human smuggling into Europe. Even before its disintegration following the NATO intervention, the country served as a gateway for migrants seeking sanctuary in Europe. And while many profit from the trafficking in people, there is also active resistance in some communities to this practice. In the small coastal city of Zuwarah(120 KMs west of Tripoli), Amazigh communities (Natives of North Africa) are on the front line, leading the fight against profiteers trafficking in men, women and children. Anti-smuggling operations have sprung up across the region. Many of them are led by youth, intent on protecting their communities and salvaging the reputation of their families. While still small scale, the impacts are far-reaching. The so-called Zuwarah-Lampedusa route, once the principle conduit for traffickers between Libya and Italy, was recently shut down. With little help from outsiders, local communities have taken matters into their own hands. While accused by some of applying rough justice, newly empowered residents are recovering their pride. In Zuwarah, as elsewhere, geography is destiny. Local residents there started to mobilize against traffickers in 2015 after a ship sunk off the city’s coastline, taking 650 migrants to a watery grave. Horrified by the disaster, Zuwaran leaders rose up against the traffickers, claiming that “Zuwarah should not be in the hands of bloodsuckers”. This represented a break from the past. After all, Zuwarans, like so many other communities in Libya, were long dependent on illegal rents, including people smuggling. Zuwarah is still more the exception than the rule. Libya is no more than a patchwork state, with its many fractious tribal groupings stitched together along trafficking routes. In many parts of the country, militia groups and rebels as well as organized criminals fill the governance void and survive on illicit economies. To some extent, smuggling and trafficking are a business in which competing groups find common cause. Yet rather than building a security apparatus to profit from the black market, Zuwarans built one to shut illicit economies down. Starting in 2015, a Zuwarah Counter Crime Unit was formed without official authorization. It is made-up of young Zuwaran volunteers and fishermen serving as a de facto city police against smugglers. The Unit has started carrying out regular raids, arresting dozens of human trafficking brokers. While offering a modicum of public order, the Unit has also come under criticism for perpetrating extra-judicial operations, conducting arbitrary arrests and committing human rights abuses. The Zuwarah Counter Crime Unit is just one example of a local response to human trafficking. Yet, that is not the entire story. From the tragedy that unfolded off the shores of Zuwarah has emerged a vibrant civil society movement seeking to end human smuggling and trafficking. It includes cultural associations, political movements and religious groups that have found common cause in tackling organized crime while demanding an end to the normalization of smuggling. Acting together, they are disrupting criminal networks by building community-based resistance. One of the more prominent civil society groups is Azref. The grassroots association operates civic workshops to educate young people on the basic rights of migrants. Their work has been so effective that the municipality of Zuwarah has joined forces to scale-up public awareness campaigns. Another organization, At-Wellol, also conducts workshops, seeking to promote the rights of minorities and help salvage the reputation of the city. While many Amazigh were marginalized and discriminated against during the Gaddafi era, they are now the vanguard of promoting minority rights. Imams are also calling for resistance against the lure of criminal economies. They argue that human smuggling is contrary to the core tenets of Islam, and that it instead sows death and hatred. Local Imams are also actively defending the rights of victims and the need for more assistance to be allocated to vulnerable migrants. Led by the Zuwarah Reform Movement, locals have mobilized on the streets of Zuwarah demanding that local authorities step up their efforts to fight human trafficking. The war against human smuggling is far from being won. Faced with resistance in Zuwarah, smugglers are shifting their operations to nearby Sabratha which is now the human smuggling hub of Western Libya. The tide of migration is still relentless. The United Nations High Commissioner for Refugees (UNHCR) registered more than 121,916 migrant sea arrivals to Italy. At least 2,992 migrants have died in transit in 2017. Yet the efforts undertaken by Zuwarans offer an alternative path. The fact is that exclusive usage of militarized approaches is not working. The bolstering of law enforcement along borders and sea routes is not stemming the tide. The EU Operation Sophia which aims to neutralize smugglers in the Mediterranean has proven to be of little success. The new AU-EU-UN migration task force in Libya is still a vague project. Ultimately, the response has to be anchored in local action, including efforts underway in municipalities like Zuwarah. If foreign powers are going to get serious about addressing human smuggling, they could do worse than strengthen community-led approaches seeking to bolster strategies to weed out traffickers.